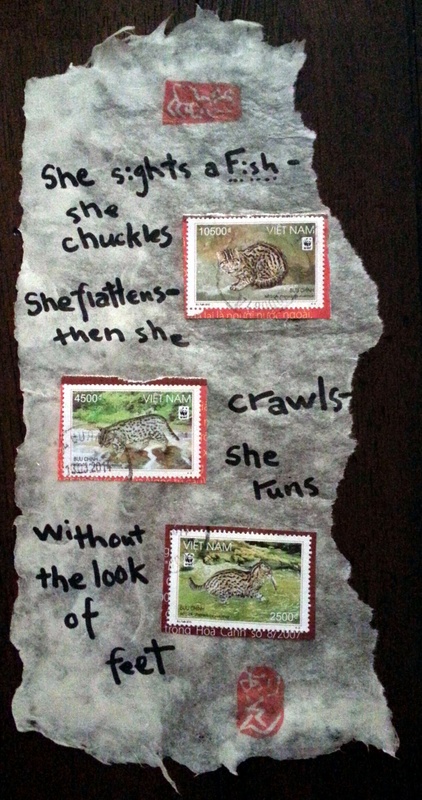 I received a lovely set of etegami from Hyu in Vietnam, enclosed in a stamp-covered envelop. I guess it takes a lot of stamps to get cards to the US! The thing that struck me about the stamps was their delicate quality. The wild cat (I don’t know what type) is painted so expressively. I instantly cut them out and added them to my growing pile of stamps. I wanted to try to integrate them into a card to send back to her, and I found an Emily Dickinson poem about a cat stalking a bird. I changed “bird” to “fish” and arranged the stamps and words onto a piece of handmade paper I made at Pyramid Atlantic Art Center last year. All those rough and thin edges on the paper — all my handiwork! The teacher kept saying I was making it too thin in spots; I can just pretend that that was intentional. without the look of feet. ← My Inbox, it overflows!